Nepal earned US $3.91 million in tourist revenue from mountaineering permits in 2013, according to figures recently released by the Nepali government. This is down from $4.22 million in 2012. In total 298 expedition teams applied for permits in 2013, against 310 who applied in 2012. The drop is interesting. The Nepalese government is keen to attract more mountaineers to the country, and has made several announcements through the media in the last year in a well-meaning if ineffective attempt to generate more interest in its lesser-known mountains. These have included opening new peaks for mountaineering, renaming peaks after famous mountaineers, setting up a police force at Everest Base Camp, and reclassifying subsidiary summits as 8000m peaks. So far these methods haven’t worked. Of 326 peaks open for mountaineering in Nepal, only 57 were visited by expeditions last year. This should perhaps come as no surprise. After all, I could change my name to Reinhold Messner, but it’s not going to stop me climbing like an inebriated walrus. The decrease has been attributed to depreciation of the Nepali currency and tourists staying away ahead of national elections which took place in November, but I wonder how many people actually checked out the date of the general election when they planned their trips to Nepal last year. The figures should, however, be taken in context as part of a bigger picture. They relate only to income generated from permit fees, which range from $100 to $25,000 per person depending on the mountain, route and size of team. They do not take into account other tourist revenue generated by mountaineering expeditions, including cost of a liaison officer, hire of porters, internal flights, accommodation, food, etc. They also appear to relate only to expedition peaks. Nepal famously has a second category of mountains known as trekking peaks which include some of Nepal’s most popular tourist mountains, such as Mera Peak and Island Peak in the Khumbu region, and the Chulu peaks in the Annapurnas. These require only a trekking permit to climb, but provide similar benefits to the local economy. It’s no surprise the world’s highest mountain is Nepal’s biggest income generator, but it may be a surprise quite how much more Everest earns compared with other mountains: more than any of the rest of them put together, in fact. An incredible 70% of Nepal’s income from climbing permits comes from Everest alone. Part of this is down to the size of the fee. On average climbers pay 5 times as much for an Everest climbing permit as they do for other 8000m peaks, and around 20 times as much as they do for 6000-7000m peaks. But mostly it’s down to popularity. Only a handful of elite climbers try new or unusual routes on Everest these days, but since Edmund Hillary and Tenzing Norgay first reached the summit via the Southeast Ridge in 1953 their route has become an achievable aim for enthusiastic amateurs thanks to the support network that has built up over the years. A team of Sherpas known as the icefall doctors maintain the route through the Khumbu Icefall with fixed ropes and aluminium ladders, and commercial operators have become expert at providing logistics and Sherpa support to enable those with enough experience at high altitude to reach the top. As importantly as any of this are dedicated weather forecasts which allow expedition leaders to identify summit windows to virtually the nearest hour. In recent years 500 to 600 people have been able to reach the top during the April to May season, and many more try and fail. And of course, Everest gets a great many ascents that generate media publicity. This man will be aiming to jump off the top dressed as a flying squirrel, and is taking a film crew from the Discovery Channel with him. I expect it won’t be long before the first gay amputee from Kazakhstan gives it a go as well, which would be a noteworthy achievement in anyone’s book. For those who can’t afford the permit fee for Everest, its sister peak has become a popular alternative. 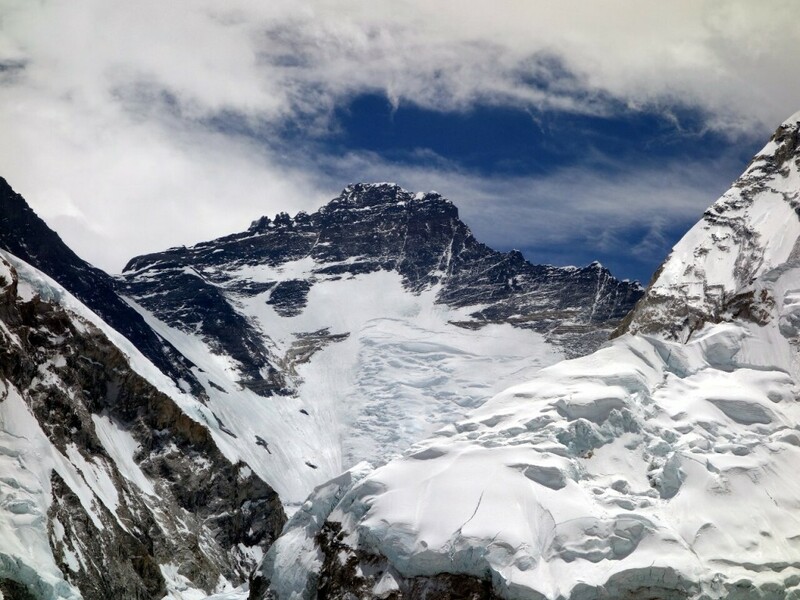 The name Lhotse translates as South Peak in Tibetan, and it shares the 7950m South Col with Everest, rising just 300m lower on the opposite side. It also shares the same route for most of the way to the summit, through the Khumbu Icefall and the Western Cwm, and up the Lhotse Face beyond Camp 3. While Everest’s Southeast Ridge route continues up to the South Col and beyond, Lhotse’s route turns right and continues up the rest of its face to the summit. The 4th highest mountain in the world was first climbed by a Swiss team in 1956, who for good measure also made the second ascent of Everest during the same expedition. In recent years some commercial operators have put climbers on both summits within days of each other, but for most of us one summit is hard enough. I’ll be attempting Lhotse myself in May. I climbed Everest from the north side two years ago, and found it relatively quiet, so I’m keen to sample the bustle and razzmatazz of the south side experience I’ve heard so much about without having to climb the mountain for a second time. The superstar Swiss climber Ueli Steck, who was involved in a fight there last year, described the atmosphere as being like Hollywood. While I’m as keen to visit Hollywood as I am to be stuck in an elevator with Piers Morgan, I’m looking forward to finding out how accurate these descriptions are. Lhotse is a steeper ascent and therefore a little more technical, but like on Everest commercial operators put up fixed ropes which annoy the purists but make the summit more attainable for people like me, who are not elite climbers. Whether I make it or not, it will hopefully be good fun. First climbed by a Japanese team in 1956, the 8th highest mountain in the world has a slightly more unusual climbing history than most other mountains. After the first Japanese attempt in 1953 an avalanche destroyed a monastery in the nearby village of Samagaon, and they were confronted by an angry mob armed with pointed sticks when they returned the following year, who believed they had upset the mountain gods. They were relieved of their trousers and had to return to Kathmandu “tackle out” (rather like an episode of the Japanese game show Endurance). In 1956 they had a secret weapon in the form of their sirdar Pasang Phutar, a famous Sherpa who had lost most of his fingers to frostbite climbing on Masherbrum in Pakistan in the 1930s. When they reached Samagaon he kidnapped the village headman, tied him to a tree and held him hostage until an agreement was reached. I’m not making any of this up, by the way. In English we have an expression all talk and no trousers, but in Samagaon I believe they have one that translates as precisely the opposite. 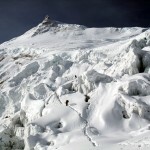 Manaslu was one of the more obscure 8000m peaks, with very few ascents, mostly by elite mountaineers. All that changed in 2008 when the Chinese government failed to issue climbing permits for Cho Oyu, an 8201m mountain in Tibet, which until then was regarded as the most attainable 8000m peak for amateur climbers, and had seen more ascents than any of them apart from Everest. A handful of enterprising operators switched their sights to Manaslu and found its standard route to be almost as straightforward as Cho Oyu when conditions were favourable. Since then it has seen many ascents by commercial teams in the September to October season. I climbed Manaslu myself in 2011, and found it to be one of the most satisfying expeditions I’ve been on. Partly this was because we were successful, and partly it was due to the great team we had, but Manaslu is also blessed with one of the most dramatic and enjoyable treks to its base, up the fantastically narrow and wooded Budhi Gandaki gorge. Although I don’t intend to climb it again I certainly hope to return to the area some day. 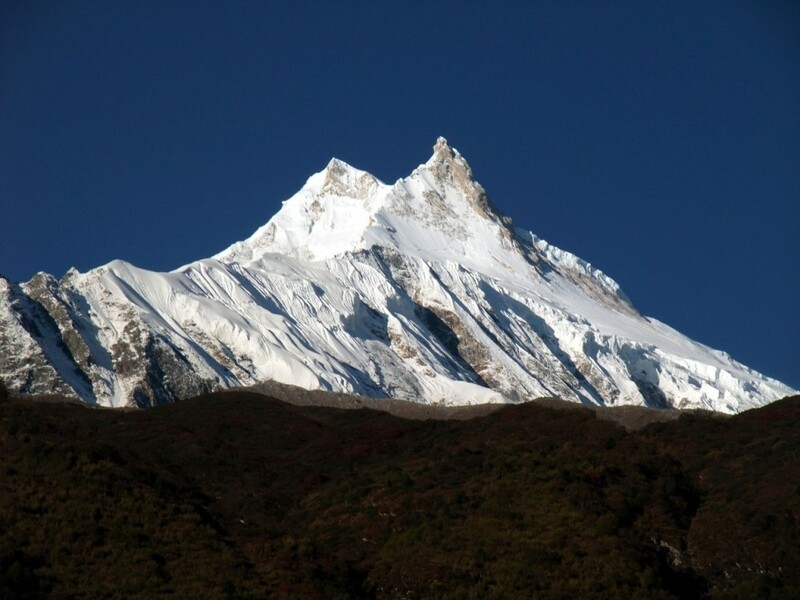 Manaslu’s rise in popularity as a climbing peak has been matched by the growing popularity of the Manaslu Circuit as a trek, which takes hikers up the gorge and around the northern side of the mountain, to cross a high pass onto the more famous Annapurna Circuit. When Ama Dablam was first climbed by a team of scientists in 1961, they nearly found themselves banned from Nepal when they returned to Kathmandu. The climbers were supposed to be conducting research into high altitude as part of the Silver Hut Expedition, led by Sir Edmund Hillary and the physiologist Griffith Pugh, but they sneaked off for a cheeky tilt at Ama Dablam during a break from their research, supposedly without a permit. Since then the Nepalese government has issued thousands of permits to climb a mountain many people regard as the most beautiful in Nepal. Rising above the village of Pangboche on the busy Everest trail, its classic armchair shape features prominently in guidebooks and tourist literature for Nepal, and even appears in the logo of a major investment bank (which some of you might think is a bit like covering a turd in sequins). Its name translates as Mother’s Jewel Box in honour of a special pendant, or dablam, worn by Sherpa women. 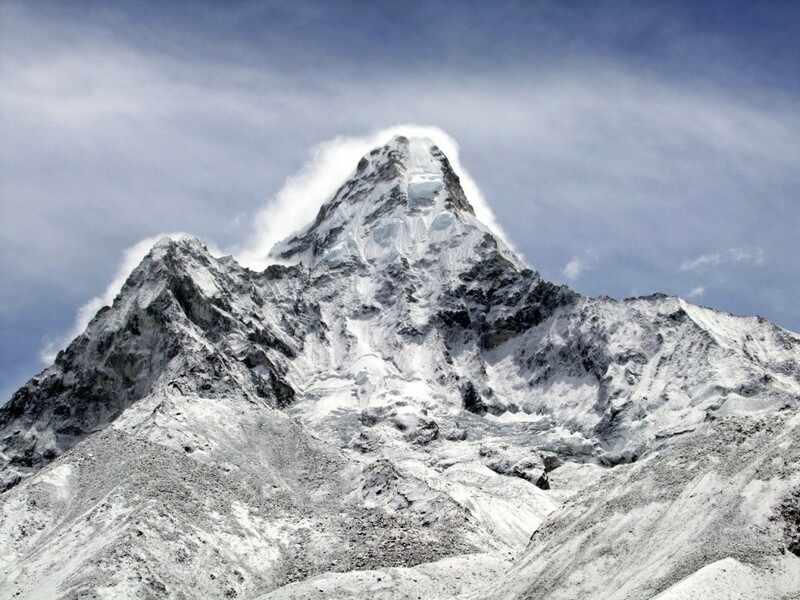 A large hanging glacier just beneath its summit is thought to resemble one, while Ama Dablam’s two extending ridges are believed to be the mother’s embrace (I should mention that Sherpas also drink quite a lot of alcohol). The mountain is popular among climbers who fancy a more technical challenge than your average Himalayan snow plod, although commercial operators now fix ropes most of the way up, which means the climb isn’t as technical as it once was. While the first four contain no surprises, many of you may not have heard of the fifth mountain on the list of Nepal’s most valuable. First climbed by a Japanese team via the East Ridge in 1983, Himlung wasn’t climbed again until 1992, when another Japanese team made an ascent of the Northwest Ridge. This has now become the standard approach, in as much as any route to Himlung can be regarded as standard. The remote desert region of Naar and Phu, north of the Annapurnas, was a refuge for Tibetan Khampas fighting a guerilla war against the Chinese government following the Chinese occupation of Tibet in 1950, and the area still contains many abandoned Khampa settlements. It has only recently been opened up for tourism again on restricted trekking permits. I travelled there in 2008, diverting north of the Annapurna Circuit up the splendidly narrow Naar Phu gorge, which cuts a slender passageway through the Himalayan divide. The villages had a mediaeval feel, and a three day trek took me to the village of Phu, where the houses had been hewn from a rock. It felt very remote, and a monastery on a hillside above the village was one of the most peaceful places I have ever been. Himlung base camp was hidden behind mountains another day further north, and it’s a real surprise it has become Nepal’s fifth richest peak for climbing. Its revenue from climbing permits was up a massive 122% on the previous year, and though this may be an anomaly due to a number of commercial teams running expeditions there last year, its standard route is not especially steep and it passes the magic 7000m in height, so it may become more popular in future years. Perhaps I had better return there soon. I will end this post with a nice little infographic containing some key stats about Nepal’s top mountaineering peaks. So there you have it, most peaks in Nepal must be relatively quiet, and if there’s anything we should take from reading this blog (apart from hemlock), it’s to make an effort to explore more of the country’s beautiful untouched peaks. “first gay amputee from Kazakhstan” priceless. Hi Mark, my first visit to Nepal was in 1986, when I spent 4 weeks trekking to Everest Base Camp from Jiri. Despite the airfare from London to Kathmandu costing me over 500 pounds, my entire trek cost 150 quid – including hiring a porter for the princely sum of 50 rupees a day! These days you’d be lucky to make that amount last a week in Nepal on the popular trekking routes. Even though that was was a long time ago, prices have gone up well beyond inflation. Nepalis have cottoned on to how much Westerners are prepared to pay and have adjusted their prices for food and accommodation accordingly, as well as their wages. I say good luck to them because tourism is their main source of revenue, but they have also become the victims of their own success to some degree. I don’t think it matters how many mountains they open up, the main cost of expeditions are food, equipment, transport etc, so the peak permit fee is just small potatoes. 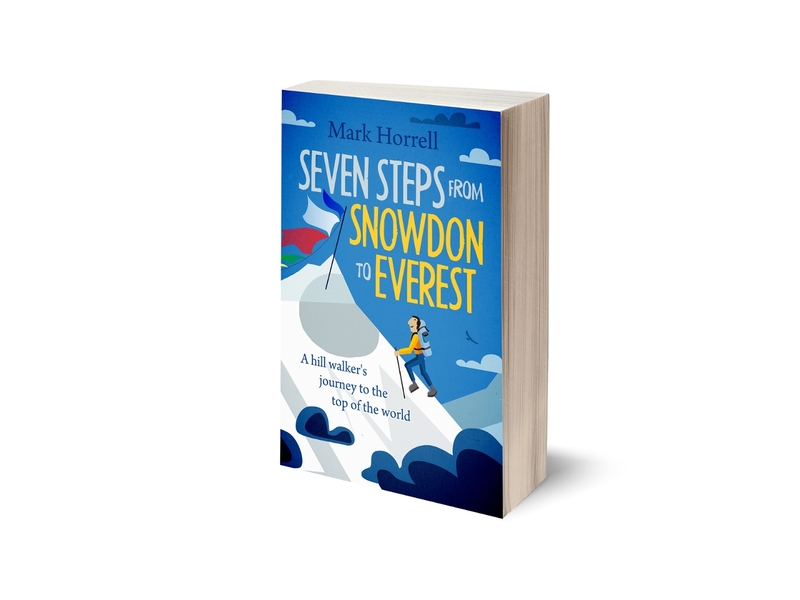 Mountaineers can be an egotistical bunch so there are unlikely to be interested in spending thousands to climb peaks that have no kudos, when they can have a go at one of the big 5 you have listed for a little more cash. I agree with most of what you say. I have no problem with paying a sizeable permit fee for the privilege of climbing in the Himalayas, and like you I believe the Nepali people have every right to raise their standard of living through tourism. I have my doubts whether the permit fee that goes directly to the government always ends up in the right places, but as you point out it covers only a small fraction of the overall costs of an expedition, and there is plenty of opportunity to pay support staff directly. I’m a little more ambivalent about your assertion that mountaineers climb for the kudos. While there are certainly those who fit that description, I believe they are only a tiny (but vocal) minority. Everest is always going to be a special case, but even on Everest climbers have a wide range of different motivations. I think much of the popularity of the big 4 can be put down to infrastructure. Commercial operators have been working on them for a while now. This makes them easier to climb, easier to find a suitable expedition to join, and ultimately makes the mountain more popular through word of mouth recommendation. Maybe you are right about the other expedition peaks attracting the more purist climbers, but Everest certainly seems to attract more than its fair share of glory-seekers – present company excepted, of course! I’m aware that the media sensationalizes the negative aspects at every opportunity, but surely some of their criticism is based on fact. 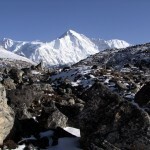 As you’re well aware, there are some fantastic opportunities for walking, trekking and mountaineering in the Nepal. It could be every bit as accessible as the Alps in years to come, but I doubt that Nepal has either the finances or the vision to develop that. The completion of various road-building projects, many of which are now funded by China as they look to create a link to south-east Asia and the Indian sub-continent, might provide the answer in the future. Great article again Mark. Reading in today’s Daily Mail that the fee for Everest has been reduced from 15k down to 6.6k per person flat fee. Many comments and remarks on their site regarding the impact both positively and negatively..time will tell but maybe Messner’s idea of allowing the mountain a period of rest is NOT about to happen in the foreseeable future.. Interesting note from Matt Smith regarding his airfare back in 86 being “over 500 pounds”. My first trip to Kathmandu in 93 cost around £650 flying from Manchester via Frankfurt with Lufthansa in the main trekking season of Oct/Nov. I’ll be back again for the umpteenth time and 21 years later this Oct/Nov for the princely sum of £570 flying from Manchester via Abu Dhabi with Etihad Airways. Just shows in life that you can still get a lot for quite a little… compared to the past anyway !!!! The latest announcement is typically eccentric. 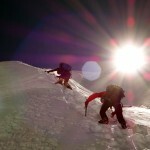 The price has only gone down for solo climbers and smaller teams. For larger teams the permit fee has actually increased slightly, which suggests there will be more mavericks on the south side in future years, like there were on the north side a few years ago before the Chinese government put the prices up. Still, at least they keep giving me plenty to write about! It’s Saturday night so I’ll drink to that – give me the Boardman Tasker Omnibus any day! Great post, Mark, as always! I cannot wait to read your dispatches from Lhotse – and see what you think about the scene on the south side of Everest. I’m guessing that we are all of a certain age to have been inspired by what I’d loosely describe as the golden era of Himalayan mountaineering. A period starting in 1950 with the ascent of Annapurna and culminating in 1986 when Messner finally climbed all 14 8000m peaks – or arguably the tenacious ascent of Everest via the Kangshung face in 1988. These ‘real climbers’ were our heroes; they invariably had icicles on their beards, often broke a limb or two on the descent (after a successful summit bid of course) and if they hadn’t peed themselves at least once to survive, well it hadn’t been a tough expedition! Despite their many trials and tribulations, obvious disagreements and notable egos, they always seemed to conduct themselves with humility and dignity. It’s not surprising that it’s still refreshing to read the accounts of their exploits all these years afterwards. Thanks for this interesting read and analysis. I’ve assumed for some time now that the world economic situation since late 2007 has been the underlying reason for people’s unwillingness to undertake expeditions as people increasingly find they can’t afford it. Austerity and debt make people more attentive to the needs of daily survival rather than perceived frivolities like gallivanting about to distant lands and climbing up mountains. There is an interesting story I heard on the BBC (and read on Colin Wallace’s informative website everest1953.co.uk)now about a plan being raised to effectively lease some of Nepal’s less popular peaks to private organisations in order to raise funds and increase participation. One wonders whether issues of loss of sovereignty will arise amongst the people of Nepal(and serve as a new cause celebre’ for disenfranchised rebel groups) in any “negotiations” between the government of Nepal and any (especially) foreign group or corporation, the latter will doubtless have the whip hand as usually happens in examples like this. One is mindful of the many lop sided “trade agreements”, trans-national participation (E.U, NATO etc. ), “status of forces” and spies of foreign forces situated in overseas national that engender resentment and outright opposition in many countries around the world, that makes one wonder if this latest proposal will really work if the backlash in so many other areas is any indicator?. Ha, I saw that story too. Call me cynical but I would be surprised if this latest fundraising idea by the Nepalese government ever amounts to anything. 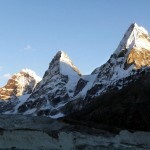 There’s something to be said for allowing a commercial organisation to operate a franchise on a lesser known trekking peak, for example by keeping the route open and maintaining fixed ropes throughout a climbing season, operating a medical service at base camp, assisting with accident and waste management, etc. I’ve thought for a while this would work well in the Manang area, where a number of straightforward trekking peaks like Pisang Peak and the Chulus are rarely climbed but have the potential to turn the area into a bit of a mountaineering resort. The idea would require some thought, investment and intensive marketing in order to work, however.